This beautiful hand-painted Russian Lacquer miniature was created by talented Fedoskino artist Sergey Stakanchikov. Sergey's artistic technique extends well beyond his amazing ability to depict accurate colors and the shape of each art work. The artist painstakingly creates each of his works first as a sculpture and then as a hand-painted miniature. 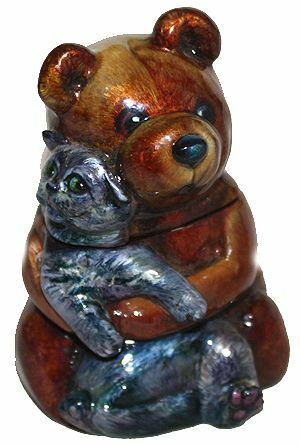 In his work "Forever Friends" Stakanchikov delightfully depicts a Cat and a Teddy Bear.